vii+99+[1 add] pages with frontispiece and diagrams. Octavo (8 1/4" x 5 3/4"). Head end pages gilt. First edition. Wilhelm Steinitz was born at Prague, Bohemia (now the Czech Republic) on May 18, 1836, that is, he was a year older than Paul Morphy. They never played against each other. He moved to Vienna, Austria, as a young man and worked as a journalist. Steinitz turning point as a Chess player started in Vienna at the end of 1858, just when Morphy was finishing his triumphal trip to Europe. On 1861, he was considered the Austrian Champion. His international career starts with the strong tournament of London, 1862. He won the Vienna city championship, and later that year he took sixth place at an international tournament in London, England. He then settled in London and made Chess his primary occupation. The London tournament was won by Anderssen that, after Paul Morphy disappearance and Staunton retirement, was considered the best player in the world. Steinitz was sixth, after Anderssen, Paulsen, Owen, MacDonnell and Dubois. We can infer therefore that, at that time, his strength was far weaker than Morphy's. Steinitz was known at that time as a strong and very creative combinative player. In London, he played one of his best games against Mongredien, one of Morphy's rivals. Nobody could expect the turn that his style would take in a few years. In the following years, Wilhelm Steinitz play improved steadily. In 1863 he defeated Englishman Joseph Blackburne and Dubois. In 1866 he defeated both Adolf Anderssen of Germany and Henry Bird of England. His defeat of Anderssen, then recognized as the world's best player, marked the beginning of Steinitz's reign as unofficial world champion. Although the next years were unfortunate for him, neither in the tournament of Paris, 1867 nor in Baden-Baden, 1870, he was able to obtain first prize. In this last tournament, Adolf Anderssen was first. It is around this moment that Wilhelm Steinitz style starts a revolutionary transformation. From being mainly a tactical Chess player, he changed to become the first strategic player in chess history. His new idea was that victory can not be obtained just by the will of power, creating attacks when there are no justified reasons to do so. Instead, attack is the logical consequence of the accumulation of small advantages obtained in the previous moves. This advantages included better development, more space, better pawn structure, pair of bishops, etc. Steinitz was the first one that understood that Chess has important constrains to creativity, it has a rigid internal logic, and only by understanding this logic is possible to win a game against strong players. He demonstrated the importance of these points of view both in his substantial writings and in his games. Steinitz's development marks the starting point of chess systematics. Before Steinitz, Chess theory was just at most a collection of tricks, especially tactical opening variations. 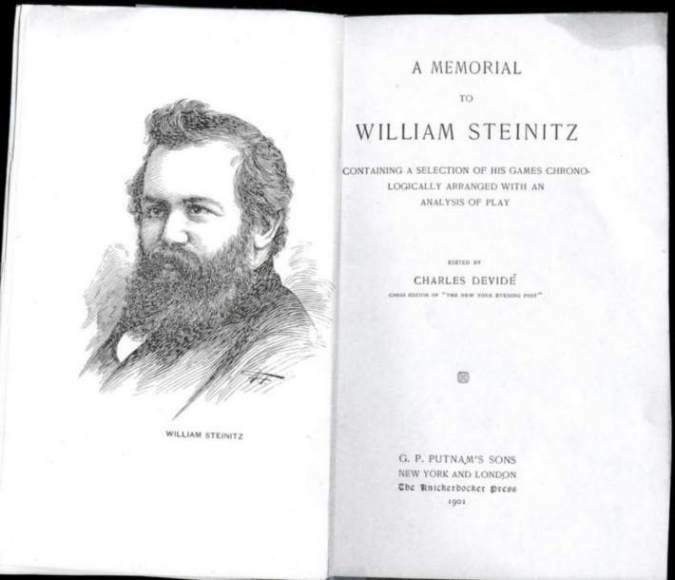 With Wilhelm Steinitz and his followers, the theory underlying not only opening, but also middle game and endgame and, most important, the logical connection between the different parts of the game, began to be understood. Although Steinitz theories have been demonstrated to be only guidelines, not to be followed with closed eyes, the rules that he developed are still the backbone of modern Chess strategy. This new and, for his contemporaries, totally strange style, brought him successes, as he never had before. Wins at London, 1872 and Vienna, 1873, easy victories in matches against Zukertort, 1872 (+7-1=4) and Blackburne, 1876 (+7-0=0). This was the highest point of Steinitz's career. His superiority over the rest of players was unquestionable. However, during the next six years after his match with Blackburne, he did not play at all. After living in London for more than 20 years, Steinitz immigrated to the United States, where he continued to dominate the Chess world. However, his loss to Polish player Johann Zukertort in a London tournament in 1883 caused some to argue that Zukertort was world champion. The debate was settled in 1886 when the two played a championship match. What made this match particularly interesting is that they decided that the winner was to be considered officially "World champion", a title until then in-existent. The match was very exciting, with Zukertort taking a strong lead in the first games, played in New York. However, Steinitz recovered in the next series, played in St. Louis, and in the last one, played in New Orleans, he definitively dominated. The final result was +10-5=5. Steinitz won easily and was crowned world champion. Wilhelm Steinitz was the first chess world champion. After winning the title, Steinitz concentrated in his writings, he made important contributions to the literature of Chess, primarily by editing numerous Chess publications. One of his most prominent posts was with The International Chess Magazine from 1885 to 1891. In the next eight years, he only played matches. He won quite convincingly against Tchigorin (1889, +10-6=1) and Gunsberg (1890-1, +6-4=9). The publication of Steinitz's "Modern Chess instructor", where several tactically doubtful opening lines were recommended because of their apparent strategic logic, led to a cable match against Tchigorin, that Steinitz lost. Tchigorin had his opportunity to be world champion in 1892, but he lost in dramatic fashion (final result, +10-8=5 for Steinitz). Steinitz was 56 already and it was clear however that his best chess was in the past. He remained the official world champion until 1894. He played a match, in New York and Montreal, against a practically unknown player called Emanuel Lasker. Lasker won easily (+10 - 5 = 4). After this match, Steinitz's chess play clearly declined. He played still in some important tournaments (Hastings, 1895; St. Petersburg, 1895-6; Nuremberg, 1896) without success. A second match against Lasker (Moscow, 1896-7) was arranged, but Wilhelm Steinitz lost overwhelmingly, +2-10=5. After a poor performance in London in 1899, Steinitz went insane and died a year later on August 12, 1900 at Wards Island, N.Y. Page head margin stained, rebound in blue cloth with gold lettering to spine and cover.